Hospitality Financial and Technology Professionals (HFTP®) is currently accepting applications from startups to compete in the European version of Entrepreneur 20X (E20X) at its upcoming HITEC® Amsterdam. Hospitality technology startups can apply via the event website – past applicants and winners are welcome to reapply as long as they are still considered Series A or a startup. The E20X competition will be open to all HITEC Amsterdam registrants, and take place on 11 April 2018 at the RAI Amsterdam Convention Centre in Amsterdam, The Netherlands. 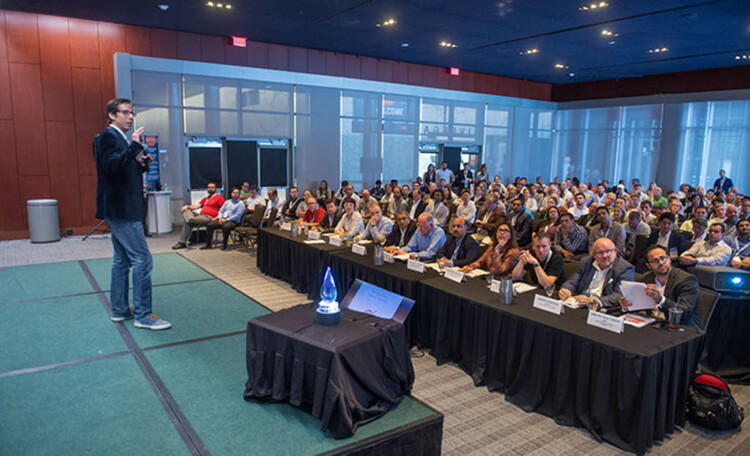 E20X serves as a platform for entrepreneurs to present their breakthrough business concepts to a room of industry experts including: hospitality CIOs, angel investors, serial entrepreneurs, industry insiders and more. Participants will compete for a grand prize of €2,500 EUR, and a guaranteed opportunity to be promoted as the champion to the industry. The E20X Judge’s Award winner, determined by the expert judge panel, receives the grand prize while the People’s Startup Award winner, determined by HITEC Amsterdam attendees, receives the crowd favorite vote. Attendees are encouraged to visit with company representatives, following the competition, and vote for their favorite startup. Watch videos from previous E20X competitions by visiting the HFTP/HITEC YouTube channel. Read exclusive interviews from former E20X grand prize winners by visiting HFTP’s official blog, HFTP Connect. HITEC Amsterdam is the first of three HITEC events planned for 2018, and will take place from 11-13 April 2018 – online registration is open now on the event website. The larger HITEC Houston will take place from 18-21 June 2018. HITEC Dubai will return in the fall of 2018. For more information about HITEC and HFTP’s other international activities, contact the HFTP Meetings & Special Events Department at education@hftp.org or visit www.hftp.org and www.hftp.org/hitec. Hospitality Industry Technology Exposition & Conference (HITEC®) is the world’s largest and oldest hospitality technology exposition and conference brand. HITEC offers a unique combination of top-notch education, and brings together the brightest minds and hottest technologies from across the globe to one place. The unparalleled event offers attendees essential education, access to top hospitality technology industry experts and the resources to find cost-effective ways to improve company bottom lines. Combined with the intimate opportunities to connect with fellow professionals, HITEC has everything to enhance your career. Historically hosted annually in a different city throughout the United States, HFTP decided to break tradition in 2017 by hosting three HITEC events all taking place outside of U.S. borders– in Toronto, Amsterdam and Dubai. This was the first time the global association’s largest HITEC event – featuring thousands of hospitality professionals from around the world –took place outside of the United States. Hospitality Financial and Technology Professionals (HFTP®) established in 1952, is an international, nonprofit association, headquartered in Austin, Texas, USA, with offices in Hong Kong, United Kingdom and the Netherlands. HFTP is recognized as the spokes group for the finance and technology segments of the hospitality industry with members and stakeholders spanning across the globe. HFTP uniquely understands the industry’s pressing issues and assists its stakeholders in finding solutions to their challenges more efficiently than any organization. It does this via its expert networks, research, certification programs, information resources and conferences/events such as HITEC. HFTP also owns the world’s only hospitality-specific search engine, PineappleSearch.com®. For more information about HFTP, email membership@hftp.org or download the HFTP/HITEC media kit. Follow HFTP/HITEC on HFTP Connect, Facebook (@HFTPGlobal; @HITECconference), LinkedIn, Twitter (@HFTP), Instagram (@HFTP_HITEC), Flickr and YouTube for the latest news. Stay tuned to HFTP’s industry-specific, informational news sites: HFTP News, HITEC Bytes, HFTP Club Bytes and HFTP Finance Bytes.